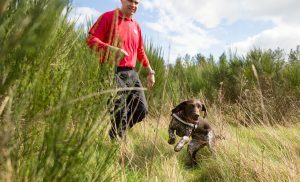 Jonathan Wright and his dog, Flynn, walk into their search area, with Jenny, a qualified dog handler from BSAR. 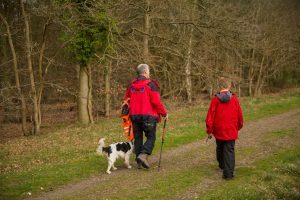 Beautiful Thetford Forest offers several different sites that are suitable for SAR training. These sites are particularly useful training grounds for the NorLSAR dog team. The dog team is an enthusiastic group of NorLSAR search technicians. Some of them are dog handlers; others are there for essential dog team support. There are currently five NorLSAR dogs in training: two are well on the way to becoming certified SAR dogs; the other three are in the early stages of their training. 7 month old GSP puppy, Juno, leads her handler to the “missing person” she has found. On Saturday, 1st April, the NorLSAR dog team met with LSAR dog assessors from Buckinghamshire and Berkshire LSAR teams for some extended training and the opportunity to watch certified SAR dogs working. LSAR groups from around the country support each other for training and during callouts. The NorLSAR dog team learnt a great deal from the assessors, and all the trainee dogs showed considerable progress since their previous extended training session. 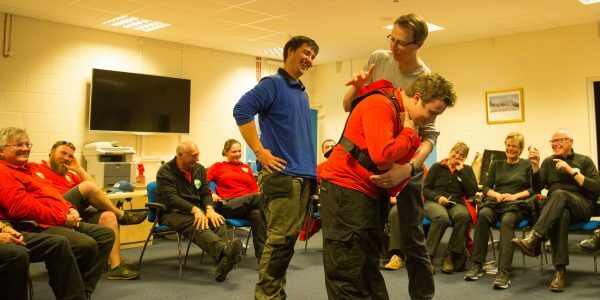 Regular training is essential for dogs, handlers and support members to ensure that NorLSAR provides a professional service to the people of Norfolk.